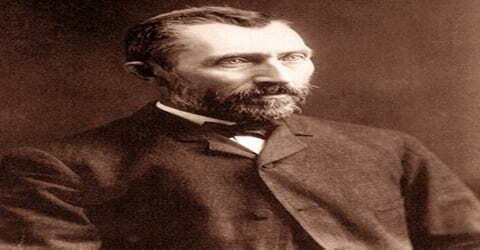 Vincent Van Gogh – Dutch Post-Impressionist Painter. 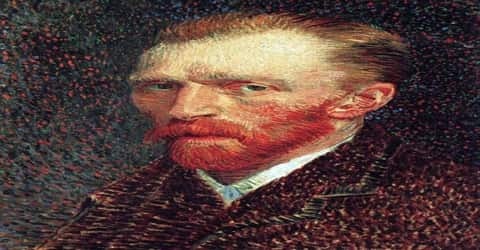 Vincent van Gogh, a Dutch painter, generally considered the greatest after Rembrandt van Rijn, and one of the greatest of the Post-Impressionists was born on 30 March 1853 into a Dutch Reformed family in Groot-Zundert, in the predominantly Catholic province of North Brabant in the southern Netherlands. In just over a decade he created about 2,100 artworks, including around 860 oil paintings and more than 1,300 watercolors, drawings and sketches, most of them in the last two years of his life. They include landscapes, still lifes, portraits, and self-portraits, and are characterized by bold colors and dramatic, impulsive and expressive brushwork that contributed to the foundations of modern art. However, he was not commercially successful and his suicide at 37 followed years of mental illness and poverty. Considered to be the greatest Dutch painter after Rembrandt, he is seen as one of the most recognizable painters in history. However, unluckily for van Gogh, much of the appreciation and glory came posthumously as he spent a life ridden by poverty, unstable mental health, and poor physical state. Van Gogh had a modest start in his life as he struggled for direction. He spent much of his adult life on an unrelenting pilgrimage tour, painting, sketching and preaching the word of God. It was in Paris that he resumed to his old love and passion of art by studying the works of new impressionist painters, and later imitating their works. 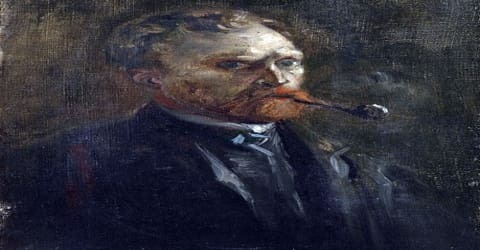 Van Gogh suffered from psychotic episodes and delusions and though he worried about his mental stability, he often neglected his physical health, did not eat properly and drank heavily. His friendship with Gauguin ended after a confrontation with a razor when in a rage, he severed part of his own left ear. He spent time in psychiatric hospitals, including a period at Saint-Rémy. After he discharged himself and moved to the Auberge Ravoux in Auvers-sur-Oise near Paris, he came under the care of the homeopathic doctor Paul Gachet. His depression continued and on 27 July 1890, Van Gogh shot himself in the chest with a revolver. He died from his injuries two days later. The striking color, emphatic brushwork, and contoured forms of his work powerfully influenced the current of Expressionism in modern art. Van Gogh’s art became astoundingly popular after his death, especially in the late 20th century, when his work sold for record-breaking sums at auctions around the world and was featured in blockbuster touring exhibitions. In part because of his extensive published letters, van Gogh has also been mythologized in the popular imagination as the quintessential tortured artist. Vincent van Gogh, in full Vincent Willem van Gogh (Dutch: ˈvɪnsɛnt ˈʋɪləm vɑŋ ˈɣɔx), was born on 30 March 1953, at Groot-Zundert in the province of Brabant, Holland, as the eldest of the six children of Theodorus van Gogh and Anna Cornelia Carbentus. His father was a minister of the Dutch Reformed Church. Van Gogh was given the name of his grandfather, and of a brother stillborn exactly a year before his birth. Vincent was a common name in the Van Gogh family: his grandfather, Vincent (1789–1874), who received a degree in theology at the University of Leiden in 1811, had six sons, three of whom became art dealers. This Vincent may have been named after his own great-uncle, a sculptor (1729–1802). Van Gogh’s uncle was a partner in Goupil and Company, art dealers. Vincent entered the firm at the age of sixteen and remained there for six years. He served the firm first in The Hague, the political seat of the Netherlands, and then in London, England, where he fell in love with his landlady’s daughter, who rejected him. Later he worked for Goupil’s branch in Paris, France. Art and religion as occupation came naturally to the van Gogh family and young Vincent was drawn to drawing since an early age which led him to take up the same as his occupation Raised in a Catholic area, he attended the Zundert village school, wherein he was taught by a Catholic teacher. For three years from 1861 to 1864, he was home trained by a governess. Later on, he attended the Jan Provily’s boarding school at Zevenbergen, post which he gained admission at Willem II College. he left school in March 1868 to return home. Born into an upper-middle-class family, Van Gogh drew as a child and was serious, quiet and thoughtful. As a young man, he worked as an art dealer, often traveling, but became depressed after he was transferred to London. He turned to religion and spent time as a Protestant missionary in southern Belgium. He drifted in ill health and solitude before taking up painting in 1881, having moved back home with his parents. In August 1881, Van Gogh’s recently widowed cousin, Cornelia “Kee” Vos-Stricker, daughter of his mother’s older sister Willemina and Johannes Stricker, arrived for a visit. He was thrilled and took long walks with her. Kee was seven years older than he was, and had an eight-year-old son. Van Gogh surprised everyone by declaring his love to her and proposing marriage. She refused with the words “No, nay, never” (“nooit, neen, nimmer”). Van Gogh had met Sien towards the end of January 1882, when she had a five-year-old daughter and was pregnant. She had previously borne two children who died, but Van Gogh was unaware of this; on 2 July, she gave birth to a baby boy, Willem. When Van Gogh’s father discovered the details of their relationship, he put pressure on his son to abandon Sien and her two children. Vincent at first defied him and considered moving the family out of the city, but in late 1883, he left Sien and the children. Van Gogh worked for Goupil in London from 1873 to May 1875 and in Paris from that date until April 1876. Daily contact with works of art aroused his artistic sensibility, and he soon formed a taste for Rembrandt, Frans Hals, and other Dutch masters, although his preference was for two contemporary French painters, Jean-François Millet and Camille Corot, whose influence was to last throughout his life. Van Gogh disliked art dealing. Moreover, his approach to life darkened when his love was rejected by a London girl in 1874. His burning desire for human affection thwarted, he became increasingly solitary. He worked as a language teacher and lay preacher in England and, in 1877, worked for a bookseller in Dordrecht, Netherlands. In January 1879 Van Gogh took up a post as a missionary at Petit-Wasmes in the coal-mining district of Borinage in Belgium. To show support for his impoverished congregation, he gave up his comfortable lodgings at a bakery to a homeless person and moved to a small hut where he slept on straw. His squalid living conditions did not endear him to church authorities, who dismissed him for “undermining the dignity of the priesthood”. He then walked the 75 kilometers (47 mi) to Brussels, returned briefly to Cuesmes in the Borinage, but gave in to pressure from his parents to return home to Etten. He stayed there until around March 1880, which caused concern and frustration for his parents. His father was especially frustrated and advised that his son should be committed to the lunatic asylum at Geel. Penniless and feeling that his faith was destroyed, he sank into despair and withdrew from everyone. “They think I’m a madman,” he told an acquaintance, “because I wanted to be a true Christian. They turned me out like a dog, saying that I was causing a scandal.” It was then that van Gogh began to draw seriously, thereby discovering in 1880 his true vocation as an artist. Van Gogh decided that his mission from then on would be to bring consolation to humanity through art. “I want to give the wretched a brotherly message,” he explained to his brother Theo. “When I sign my paintings ‘Vincent,’ it is as one of them.” This realization of his creative powers restored his self-confidence. After being rebuffed by the Christian authorities for undermining the dignity of priesthood by living in squalid conditions, he returned home and stayed there for almost a year; a fact which became a matter of concern for his parents. He then returned to Cuesmes and stayed with Charles Decrucq. Following the advice of Dutch artist Willem Roelofs, he attended the Academie Royale des Beaux-Arts in Brussels, where he studied anatomy and standard rules of modeling and perspective. He aspired to become an artist in God’s service. Van Gogh’s artistic career was extremely short, lasting only the 10 years from 1880 to 1890. During the first four years of this period, while acquiring technical proficiency, he confined himself almost entirely to drawings and watercolors. First, he went to study drawing at the Brussels Academy; in 1881 he moved to his father’s parsonage at Etten, Netherlands, and began to work from nature. Late in 1881, Van Gogh settled at The Hague to work with a Dutch landscape painter, Anton Mauve. He visited museums and met with other painters. Van Gogh thus extended his technical knowledge and experimented with oil paint in the summer of 1882. In 1883 the urge to be “alone with nature” and with peasants took him to Drenthe, an isolated part of the northern Netherlands frequented by Mauve and other Dutch artists, where he spent three months before returning home, which was then at Nuenen, another village in the Brabant. In 1885, Van Gogh started working on what became his magnum opus or his first masterpiece, ‘The Potato Eaters’. The work was first exhibited in the window of the paint dealer Leurs in The Hague. He then moved to Paris where impressionism became a dominant art form. He too was inspired by the same and began studying with Henri de Toulouse-Lautrec, Pissarro and others. He soon became interested in Japanese art and began studying eastern philosophy in detail, which he believed would assist him in coming up with authentic drawing. Van Gogh remained at Nuenen during most of 1884 and 1885, and during these years his art grew bolder and more assured. He painted three types of subjects still life, landscape, and figure all interrelated by their reference to the daily life of peasants, to the hardships they endured, and to the countryside they cultivated. 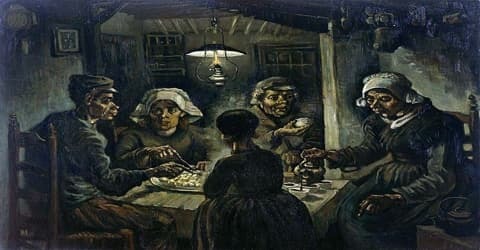 Émile Zola’s Germinal (1885), a novel about the coal-mining region of France, greatly impressed van Gogh, and sociological criticism is implicit in many of his pictures from this period e.g., Weavers and The Potato Eaters. Eventually, however, he felt too isolated in Nuenen. Van Gogh took the higher-level admission exams at the Academy of Fine Arts in Antwerp, and in January 1886 matriculated in painting and drawing. He became ill and run down by overwork, poor diet, and excessive smoking. He started to attend drawing classes after plaster models at the Antwerp Academy on 18 January 1886. He quickly got into trouble with Charles Verlat, the director of the Academy and teacher of a painting class, because of his unconventional painting style. 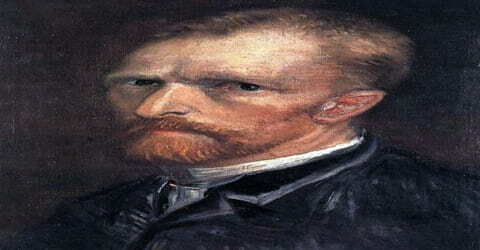 Van Gogh had also clashed with the instructor of the drawing class Franz Vinck. Van Gogh finally started to attend the drawing classes after antique plaster models given by Eugène Siberdt. On 31 March 1886, which was about a month after the confrontation with Siberdt, the teachers of the Academy decided that 17 students, including van Gogh, had to repeat a year. The story that van Gogh was expelled from the Academy by Siberdt is therefore unfounded. By the summer of 1887, Van Gogh was painting in pure colors and using broken brushwork that is at times pointillistic. Finally, by the beginning of 1888, van Gogh’s Post-Impressionist style had crystallized, resulting in such masterpieces as Portrait of Père Tanguy and Self-Portrait in Front of the Easel, as well as in some landscapes of the Parisian suburbs. Longing for a place of light and warmth, and tired of being entirely financially dependent on Theo, Van Gogh left for Arles in southern France in February 1888. The pleasant country about Arles and the warmth of the place restored Van Gogh to health. In his fifteen months there he painted over two hundred pictures. At this time he applied color in simplified, highly dense masses, his drawing became more energetic and confused than ever before, and objects seemed to radiate a light of their own without giving off shadows. During this period he also turned to painting portraits and executed several self-portraits. Among the masterpieces of his Arles period are the Fishing Boats on the Beach at Saintes-Maries (June 1888); the Night Café (September); and the Artist’s Bedroom at Arles (October). The pictures he created over the following 12 months depicting blossoming fruit trees, views of the town and surroundings, self-portraits, portraits of Roulin the postman and other friends, interiors and exteriors of the house, sunflowers, and landscapes marked his first great period. In these works, he strove to respect the external, visual aspect of a figure or landscape but found himself unable to suppress his own feelings about the subject, which found expression in emphatic contours and heightened effects of color. Once hesitant to diverge from the traditional techniques of painting he worked so hard to master, he now gave free rein to his individuality and began squeezing his tubes of oil paint directly on the canvas. Van Gogh’s style was spontaneous and instinctive, for he worked with great speed and intensity, determined to capture an effect or a mood while it possessed him. At Arles Van Gogh suffered fainting spells and seizures (involuntary muscle spasms). The local population began to turn against him as well. Paul Gauguin (1848–1903), responding to his invitation, visited him in October 1888, but the two men quarreled violently. Gauguin left for Paris. Van Gogh, in a fit of remorse and anger, cut off his ear. On May 9, 1889, he asked to be admitted to the asylum at Saint-Rémy-de Provence, a hospital for the mentally ill. In early 1888, he moved to the South of France. Much of his paintings of this time were based on the local landscapes and light and had predominant use of yellow, ultramarine and mauve. He came up with a series of paintings such as ‘Van Gogh’s Chair’, ‘Bedroom in Arles’, ‘The Night Cafe’, ‘Cafe Terrace at Night’, ‘Starry Night Over the Rhone’, ‘Still Life: Vase with Twelve Sunflowers’. The time in Arles became one of Van Gogh’s more prolific periods: he completed 200 paintings, and more than 100 drawings and watercolors. He was enchanted by the local landscape and light; his works from this period are rich in yellow, ultramarine and mauve. His paintings include harvests, wheat fields and general rural landmarks from the area, including The Old Mill (1888), a picturesque structure bordering the wheat fields. This was one of seven canvases sent to Pont-Aven on 4 October 1888 in an exchange of works with Paul Gauguin, Émile Bernard, Charles Laval, and others. In March 1888 Van Gogh painted landscapes using a gridded “perspective frame”; three of the works were shown at the annual exhibition of the Société des Artistes Indépendants. In April, he was visited by the American artist Dodge MacKnight, who was living nearby at Fontvieille. On 1 May 1888, for 15 francs per month, he signed a lease for the eastern wing of the Yellow House at 2 places Lamartine. The rooms were unfurnished and had been uninhabited for months. On 7 May Van Gogh moved from the Hôtel Carrel to the Café de la Gare, having befriended the proprietors, Joseph and Marie Ginoux. The Yellow House had to be furnished before he could fully move in, but he was able to use it as a studio. He wanted a gallery to display his work, and started a series of paintings that eventually included Van Gogh’s Chair (1888), Bedroom in Arles (1888), The Night Café (1888), Café Terrace at Night (September 1888), Starry Night Over the Rhone (1888), and Still Life: Vase with Twelve Sunflowers (1888), all intended for the decoration for the Yellow House. 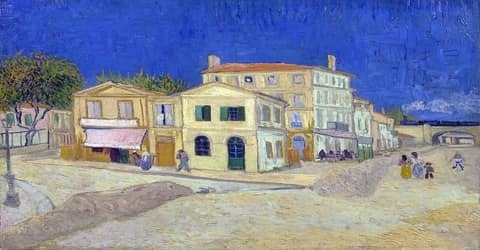 In the year Van Gogh spent at the asylum he worked as much as he had at Arles, producing 150 paintings and hundreds of drawings. 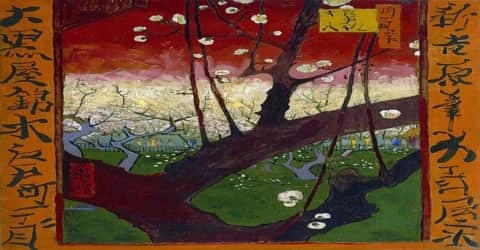 Van Gogh suffered several attacks but was completely peaceful in between. At this time he received his first critical praise (a good review), an article by the writer Albert Aurier. During his stay, he began painting the clinic and hospital garden which became the main subject of his drawings. He came up with several masterpieces including, ‘The Starry Night’, ‘Olive Trees with the Alpilles in the Background’, ‘Cypresses’, ‘Cornfield with Cypresses’ and ‘Country road in Provence by Night’. Other works of this time include two versions of ‘Bedroo in Arles’, five versions of ‘L’Arlesienne’, ‘Two Peasant Women Digging in a Snow-Covered Field at Sunset’ and ‘Sorrowing Old Man (‘At Eternity’s Gate’)’. Limited access to life outside the clinic resulted in a shortage of subject matter. Van Gogh instead worked on interpretations of other artist’s paintings, such as Millet’s The Sower and Noonday Rest, and variations on his own earlier work. Van Gogh was an admirer of the Realism of Jules Breton, Gustave Courbet, and Millet, and he compared his copies to a musician’s interpreting, Beethoven. His The Round of the Prisoners (1890) was painted after an engraving by Gustave Doré (1832–1883). Tralbaut suggests that the face of the prisoner in the center of the painting looking towards the viewer is Van Gogh himself; Jan Hulsker discounts this. In 1890, he left the clinic in Saint-Remy to move near the physician Dr. Paul Gachet in Auvers-sur-Oise. During this time, he painted several paintings such as ‘Portrait of Dr. Gachet’, ‘The Church at Auvers’, ‘Wheat Field with Crows’ and two paintings of ‘Daubigny’s Garden’. A sensational news story reported that a deranged van Gogh then visited a brothel near his home and delivered the bloody body part to a woman named Rachel, telling her, “Guard this object carefully.” The 21st-century art historians Hans Kaufmann and Rita Wildegans, however, examined contemporary police records and the artists’ correspondence and concluded, in Van Gogh’s Ohr: Paul Gaugin und der Pakt des Schweigens (2008; “Van Gogh’s Ear: Paul Gauguin and the Pact of Silence”), that it was actually Gauguin who mutilated van Gogh’s ear and that he did so with a sword. Whatever transpired, van Gogh took responsibility and was hospitalized; Gauguin left for Paris. In June 1890, Van Gogh painted several portraits of his doctor, including Portrait of Dr. Gachet, and his only etching. In each, the emphasis is on Gachet’s melancholic disposition. There are other paintings which are probably unfinished, including Thatched Cottages by a Hill. In July, he wrote that he had become absorbed “in the immense plain against the hills, boundless as the sea, delicate yellow”. He had first become captivated by the fields in May when the wheat was young and green. In July he described to Theo “vast fields of wheat under turbulent skies”. In his last painting, the Cornfield with Crows, Van Gogh showed a topsy-turvy world. The spectator himself becomes the object of perspective, and it is toward him that the crows appear to be flying. On 27 July 1890, aged 37, Van Gogh shot himself in the chest with a 7mm Lefaucheux à broche revolver. There were no witnesses and he died 30 hours after the incident. The shooting may have taken place in the wheat field in which he had been painting, or a local barn. Luckily the shot did not cost him his life but an untreated wound resulted in his death 29 hours after he shot himself. He was buried on July 30 in the municipal cemetery of Auvers-sur-Oise. His funeral was attended by Theo van Gogh, Andries Bonger, Charles Laval, Lucien Pissarro, Emile Bernard, Julien Tanguy and Dr. Gachet amongst 20 other family members and friends. Theo had been ill, and his health began to decline further after his brother’s death. Weak and unable to come to terms with Vincent’s absence, he died on 25 January 1891 at Den Dolder and was buried in Utrecht. 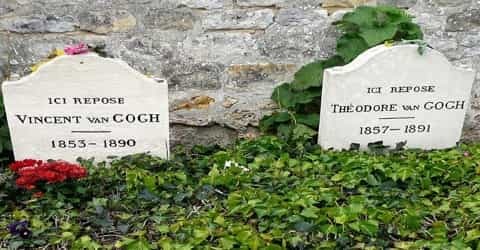 In 1914, Johanna van Gogh-Bonger had Theo’s body exhumed and moved from Utrecht to be re-buried alongside Vincent’s at Auvers-sur-Oise. Largely on the basis of the works of the last three years of his life, van Gogh is generally considered one of the greatest Dutch painters of all time. His work exerted a powerful influence on the development of much modern painting, in particular on the works of the Fauve painters, Chaim Soutine, and the German Expressionists. Yet of the more than 800 oil paintings and 700 drawings that constitute his life’s work, he sold only one in his lifetime. Always desperately poor, he was sustained by his faith in the urgency of what he had to communicate and by the generosity of Theo, who believed in him implicitly. The letters that he wrote to Theo from 1872 onward, and to other friends, give such a vivid account of his aims and beliefs, his hopes and disappointments, and his fluctuating physical and mental state that they form a unique and touching biographical record that is also a great human document. Van Gogh strove to be a painter of rural life and nature, and during his first summer in Arles he used his new palette to paint landscapes and traditional rural life. His belief that a power existed behind the natural led him to try to capture a sense of that power, or the essence of nature in his art, sometimes through the use of symbols. His renditions of the sower, at first copied from Jean-François Millet, reflect Van Gogh’s religious beliefs: the sower as Christ sowing life beneath the hot sun. These were themes and motifs he returned to often to rework and develop. His paintings of flowers are filled with symbolism, but rather than use traditional Christian iconography he made up his own, where life is lived under the sun and work is an allegory of life. In Arles, having gained confidence after painting spring blossoms and learning to capture bright sunlight, he was ready to paint The Sower. 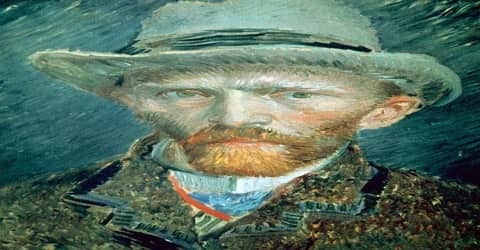 Van Gogh’s fame dates from the early years of the 20th century, and since then his reputation has never ceased to grow. 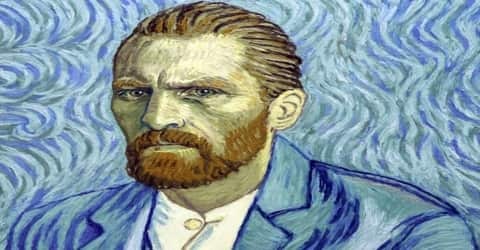 A large part of this reputation is based on the image of van Gogh as a struggling genius, working unappreciated in isolation. The dramatic elements of his life poverty, self-mutilation, mental breakdown, and suicide feed the drama of this mythology. The notion that his unorthodox talent was unrecognized and rejected by society heightens the legend, as it is just that sort of isolation and struggle that has come to define the modern concept of the artist. This mythical van Gogh has become almost inseparable from his art, inspiring artists to dramatize his saga in poems, novels, films, operas, dance ensembles, orchestral compositions, and a popular song. Wide and diverse audiences have come to appreciate his art, and the record-breaking attendance at exhibitions of his works as well as the popularity of commercial items featuring imagery from his oeuvre reveal that, within the span of a century, van Gogh has become perhaps the most recognized painter of all time.